I’m not really sure why, but my brain was firing with randomness earlier this evening. Not that this is anything new. I started a Tweet session where I just let this urge run wild. Here’s what it turned into. If I ever become a zombie, I hope I’m the fast kind–not the slow, pathetic kind. Oh! And no maggots. They’d distract me too much. Also, if I ever become a zombie, I hope I don’t eat any of my friends. I hope I’d be a good enough friend to still be nice. You know? If I ever become a zombie, I think it’d be cool to “pretend” like I was still alive. Take baths, fix my hair, order stuff online. If I was a zombie, and I was eating live people, I wouldn’t also want to be considered a cannibal. It’s not the same. And that would hurt. If I was zombie, I’d still want to eat sushi & chocolate & tomatoes. Not just brains. That would get so old so quick. If I became a zombie, would I *know* it wasn’t always so? Or would I just be like: ‘Oh–I’ve always been this way. Can’t change who I am.’? If I become a zombie, I want to be able to climb trees. & be arrow-proof. & maybe teach the other zombies language skilz besides grunting. Also, I’d like to be the zombie to begin peace negotiations with the homo sapiens. The world is big enough for more than 1 humanoid species. If I was a sasquatch, I’d need a lady-in-waiting. I could brush most of my hair, but some would be out of reach. Even with my long arms. If I was a sasquatch, I’d definitely wear a shirt. Maybe pants, too. But definitely a shirt. If I was a sasquatch, I’d donate all I could to Locks of Love. I would hope others would do the same for me if I was in need. If I was a sasquatch, I wouldn’t hide all the time. I mean, if I was photogenic, I would totally do a photo shoot for People or NatGeo. I’d like a nice condo if I was a sasquatch. The forest is cool and all, but I bet it gets lonely out there sometimes. If I was a sasquatch, I’d go trick-or-treating. That way I could get close to people and they wouldn’t shoot me. If I was a sasquatch, I would do Chewbacca impressions at parties. And maybe play bartender. If I had a big hairnet or a trench coat. If I was a sasquatch, I bet it’d be pretty easy to get product endorsements. Maybe for like haircare, ski equipment, and probably Gatorade. If I was a sasquatch, I might stay in the woods, though. Maybe become a Christmas tree farmer or a Park Ranger. But not a lumberjack. If I was a unicorn, I’d be the kind with a beard. I’d probably braid it, or wear a little barrette in it. A red one. No sparkles, though. If I was a unicorn, I’d want a brass tag attached 2 my horn. It would say: If you kill me, my magical horn will dissolve. It’s not worth it. If I was a unicorn, I would sneak into a zoo and only let little kids see me. And maybe sad people. yes. The sad people, too. If I was a unicorn, I’d grant wishes for sure. But not in the country or suburbs. In the city. Where folks wouldn’t’ expect me to show up. If I was a unicorn, I would eat all the bombs. If I was a unicorn, I’d want my mane to move all the time. Even when there was no wind. And I’d blink really slowly and almost grin. Also, if I was a unicorn, I’d roll around in clover and whinny. But it wouldn’t sound like a horse. More like a little girl giggling. If I was a unicorn, I’d be playful. Like riding around on tricycles and maybe doing the Moonwalk at the Super Bowl half-time show. If I was a unicorn, I’d heal people of cancer. But only if they were brave enough to climb on my back. And believe. If I was a unicorn, I’d like to do a reality show with a bunch of meanies. I’d teach them lessons along the way, & refuse to take the money. Lastly, if I was a unicorn, I’d invite all the sasquatches & zombies over for tea. And we’d tell jokes and play games and hug a lot. This entry was posted in Invisible Ink, Writing and tagged humanoid species, locks of love, peace negotiations. Bookmark the permalink. You would be a kickass unicorn! Sasquatch? Have you seen the movie “Yeti, a gay love story”? For reals! And zombies get old fast, and by old I mean stinky. 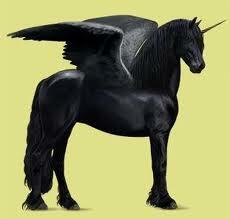 I still believe your Beyonce Unicorn tweets were boss. I’m still chuckling. I have already promised to help take care of him if he was a zombie, so long as he promised not to eat me, and if he did get weird he was warned he’d be shot. HOWEVER his random thoughts on unicorn life are amussing he should be a unicorn not a zombie for sure! Yeah, I’m guessing that if any of these happened, I wouldn’t really have a choice in the matter. I’d have to just make the most of the situation. When I was a kid, I drew unicorns. Never actually thought of *being* one back then. hahahahahahahahahahahahahahahahahahahahahahahaha! Thanks for the laugh!! If I was a zombie, I’d gate crash the Run For Your Lives 5K Obstacle Course and show the guys in the costumes how it’s really done. If I was a sasquatch, I’d weave my excess hair into sweaters, and hang them on Lady Gaga. If I was a unicorn, I’d challenge My Little Pony to a duel, scaring princesses everywhere.